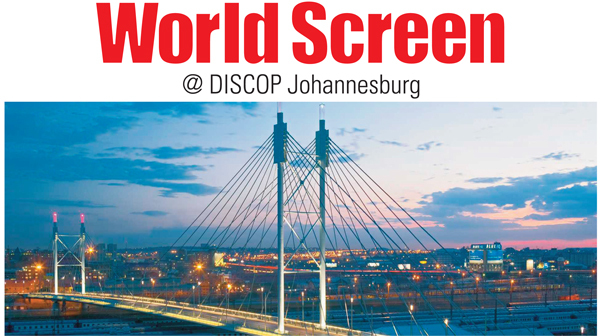 The November 2018 edition of WORLD SCREEN will have distribution at DISCOP Johannesburg. This is also our pre-International Emmys edition and will be distributed at the International Emmys World Television Festival in New York. ﻿1. WORLD SCREEN is mailed to our extensive circulation of program buyers worldwide, giving you exposure in over 120 countries. 2. You will receive a free double banner in World Screen Newsflash, our industry-leading daily newsletter reaching 35,000 executives around the world, during the weeks of November 5 and November 12. ﻿3. ﻿Your company will receive a profile (including a color image of a highlighted program and the headshot of the executive interviewed) in the front section of the magazine. 4. The profile will also appear in one of our daily newsletters before the market. ﻿5. You will receive invaluable social media exposure by having your profile tweeted to @worldscreen's followers. 6. ﻿The profile and your advertisement will also appear in the digital edition, reaching 35,000 media executives a week before the event. 7. We will place your electronic box ad on the home page of TVMEA.ws for one month. 8. You will have your own Screening Room on our video portal WorldScreenings.com. The Screening Rooms will be extensively promoted during the weeks prior to the event, and will be kept on our portal for two months. 9. Your company's news will receive priority treatment in our 4 online daily newsletters, 10 online weekly newsletters and 22 websites.